Leading sports and entertainment collectibles company, Upper Deck, and the National Hockey League Players� Association (NHLPA) have agreed to a partnership allowing Upper Deck to produce and distribute Hockey trading card products featuring the Be A Player branding. Originally developed in conjunction with Upper Deck in 1994, Be A Player products will return to the Upper Deck lineup in 2005, the first time since the 1995/96 season. Upper Deck�s first release, slated for the Spring, will be Be A Player Signature Edition, featuring an autograph in every pack for a suggested $9.99 per pack. Be A Player remains one of the industry�s most recognizable brands year-in and year-out. Upper Deck�s Be A Player release features an all-star list that includes Jason Spezza, Joe Thornton, Jarome Iginla and many more, including long-time Upper Deck spokesmen Wayne Gretzky and Gordie Howe. 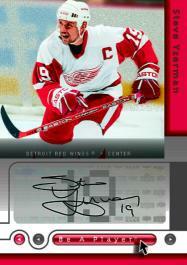 Content highlights include single, dual, triple, and quad autograph cards of the NHL�s elite. "The Upper Deck Company is excited to once again partner with the NHLPA and deliver this exceptional product to fans and collectors," said Joe Fallon, Director of Sports Product Development for the Upper Deck Company. "Adding Be A Player back into our portfolio strengthens what is already an industry leading lineup of products, and fits quite nicely alongside Brands such as SP Authentic, SPx and our core Upper Deck." "Upper Deck is the leader in the card and collectibles industry, and furthering our partnership makes perfect sense," said NHLPA Senior Director Ted Saskin. "The NHLPA recognizes the need to work with a market leader who has demonstrated a consistent commitment to the category and has the infrastructure and marketing capabilities to best support our assets during these challenging times. Granting the Be A Player rights to Upper Deck is representative of the overall direction we are taking to improve the current hockey card landscape so that long-term growth objectives can be realized. The Be A Player Brand is important to the NHLPA and its members, and I am confident Upper Deck will continue to build on what they helped establish in 1994."